Having vowed to walk lightly through life, and to do without the frills which are quite literally costing us the earth, we sometimes find ourselves with a quandary: whether to fulfil our needs and desires, or whether to go without. One of the fundamental problems with modern society is that we all burn too much oil and buy too much stuff. We burn oil in our cars and boats, and we burn it when we use fossil-fuel electricity or buy products whose production and distribution involved the use of fossil fuels. In fact, when you think about it, it’s almost impossible these days to buy anything which is not in some way tainted with fossil-fuel use and which does not contribute to global warming, and all that that entails. Even an organic carrot is tainted – unless you walked, or rode your donkey, to the farm where it was grown! What does this have to do with buying new sails? Well, sailing boats are just about the cleanest greenest things that man has ever invented. Harnessing the wind, we can cross the oceans and circle the entire world without doing any harm… or at least, that’s the way it appears. In reality, just as the creation of a bicycle or a solar panel involves the use of planet-destroying combustion, so too, before you can go with the wind you generally need to invest some non-renewable resources in the undertaking. Only the best will do, just so long as it’s also the cheapest! Our philosophy, aboard Mollymawk, is to grit our teeth and use the best materials that we can afford. If it’s paint you’re talking about, we want the best system so that we only have to do the job once; we don’t want to spend more time, money, and environmental resources doing the same job again in three years’ time. 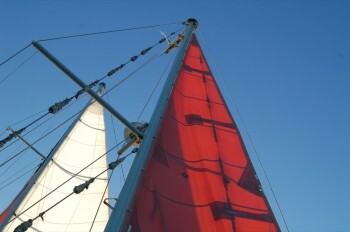 The same thing goes for every other part of the boat – and that includes the sails. 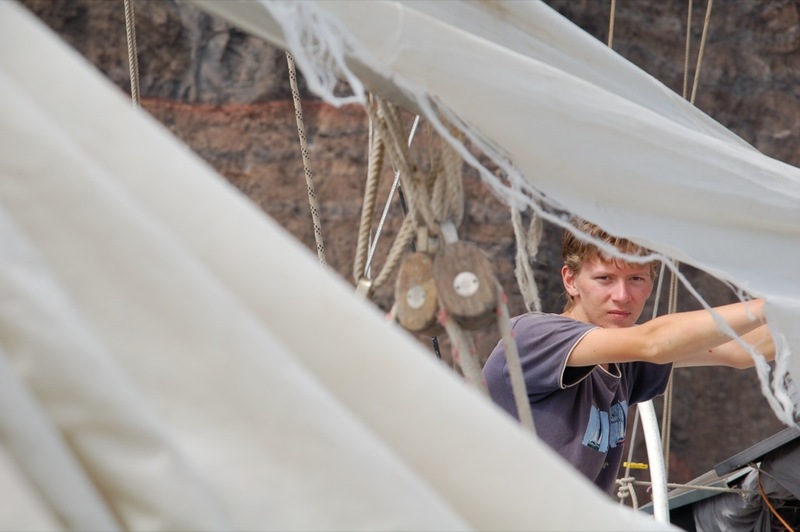 When we buy a sail we require that it remain in good shape and do the job of pulling the boat along for as many years as possible. However, this requirement is balanced by financial considerations. What is the difference between a low-priced sail and a dirt-cheap sail? Is one any worse than the other? Well, we were about to find out. This brings us back to that quandary: when can a cruising yotty justify buying a new sail? Well, so far as we’re concerned, the answer is when the old one is so far gone that you blow it out every time the wind pipes up above force five! Living a hand-to-mouth existence we wouldn’t, in any case, be able to afford one before it became a necessity, but – then again – no one should be messing about in a boat whose gear is so old and ropey that it won’t hook him off a lee shore or get him to the bar before last orders. 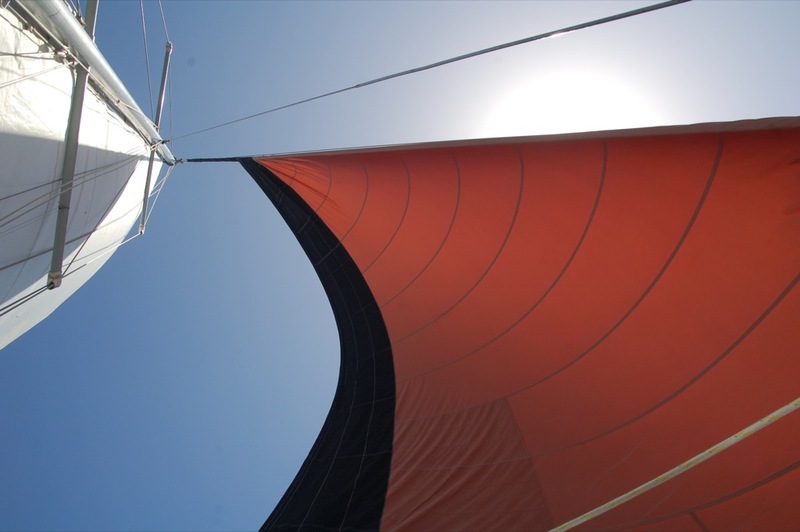 When the sail tears – and not just along the seams – then it’s definitely time for a new one. When we launched Mollymawk we had the good fortune to come across a set of second-hand sails which pretty much fitted the boat. They had never been out of the bag – they came from a home-built boat which was sold on before she was launched – and they were immaculate. But that was thirteen years ago, and sails, hard-used in the tropical sun, don’t last for more than ten years at best. When the chore of mending them on a daily basis became too tiresome we counted out our pennies and started to look around. Well, the first place we tried was China. We’ve had good sails in the dim and distant past from the Chinese, but things seem to have gone down-hill since then. The moment when your new sail turns up is always an exciting one – it’s as if you’d got hold of Santa’s bag! – but in this case the anticipation was followed very quickly by disappointment. The merest glance showed us that our new sails were poorly made, and it was clear they would not stand up to the kind of life we lead. We have since learnt that our troubles were partly derived from the fact that we chose “tanbark” cloth. 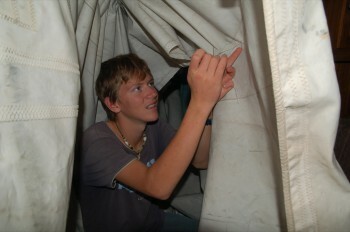 When we hung the sails up we were horrified to see pin-prick holes! Seemingly, top quality tan sail cloth is dyed during the finishing process, but the cheaper stuff is produced either by pressure cooking the cloth or by weaving it from dyed threads. The heat and pressure of the former process damages the integrity of the cloth. The idea of using tan-coloured threads sounds good to me, but apparently the process of dyeing them makes them smaller in diameter and results in a looser weave. On its very first outing the Chinese sail began to part company with its bolt rope. Even without regard for the appalling quality of the cloth, the Chinese sails were second rate. The stitching was poor, with incorrect tension in places, and the cloth didn’t have the UV coating which we had specifically requested. 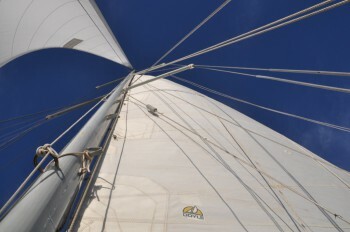 The bolt-rope on the genoa was pathetically thin and would obviously pull out of the luff-groove on the roller-furler; the clews were attached with narrow webbing straps… and so on. 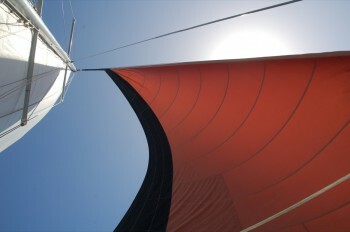 The Chinese genoa showed its worth on its very first outing, when the sail began to tear away from the bolt-rope. And that was just in a force four! 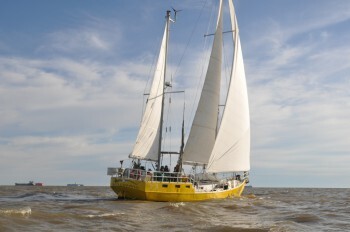 It was plain that the sails were not suitable for a yacht which is bound for Tierra del Fuego. So, after that we searched more carefully – still aiming to spend as little money as possible, but ruling out suppliers in countries where there is no tradition of yachting and sailmaking. We rounded up a bunch of quotes – and the one which came in first place was Doyle Caribbean. By now our old mains’l was so rotten that it fell apart every day (quite literally!) 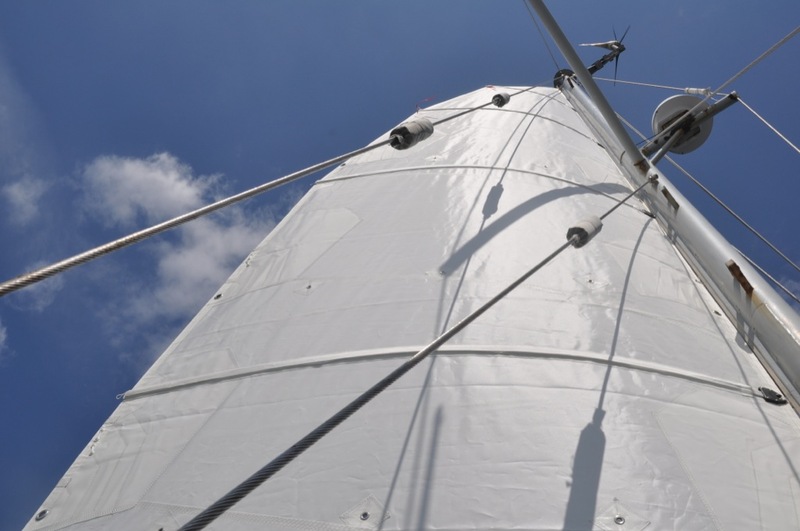 Following a lengthy discussion via e-mail we ordered a fully-battened main which Doyle Caribbean delivered within a fortnight – and that notwithstanding the fact that we were in Bermuda at the time. We had originally requested a quote for a sail whose top two battens would be full length while the others would be of the conventional sort. It was Doyle Caribbean’s MD, Bob Phillips, who talked us into going for a fully-battened affair – and we have not regretted taking his advice. When that sail arrived it really was like Christmas. We got it out and fondled it; we examined its every fitting and its every stitch; and then we hung it up and grinned all over our faces. “Now, that’s what I call a sail!” said Nick. Of course, the proof lies in the beating and in the light airs, in the mileage and in the years of endurance. Well, all of this took place three and a half years ago in another hemisphere… and we’re still damn pleased with our mainsail! “What’s so good about it?” you ask. Well, for a start, it’s properly made. The stitching is good and tight, and everything is strongly built with massive reinforcing. Every edge is double taped, and all of the stitching is coated with a UV resistant polymer. This stuff is very important. 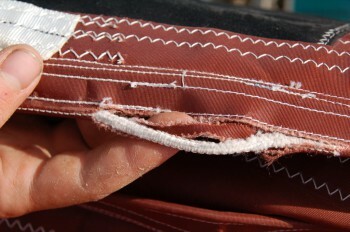 Our Chinese genoa is only six months older than the Doyle main but already the stitching is rotten! 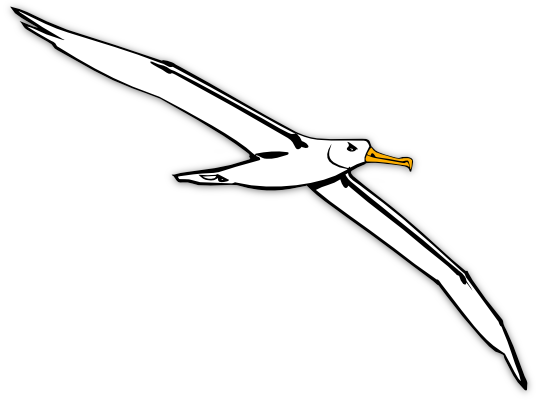 (In fact, the genoa has only spent a total of about two years on the foil, exposed to the elements. Whenever it begins to need another seam restitched we whip it down and hoist the tired old radial-cut sail which a friend gave to us.) 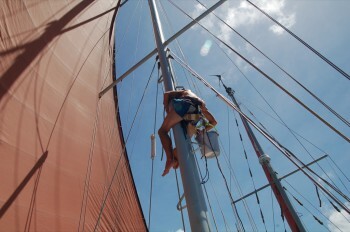 Doyle’s sails are guaranteed for 5 years or 50,000 miles, so there’s no question of facing this kind of problem. Too few slides caused excessive strain on parts of the track, with the result that the rivets broke and the track began to pull off the mast. 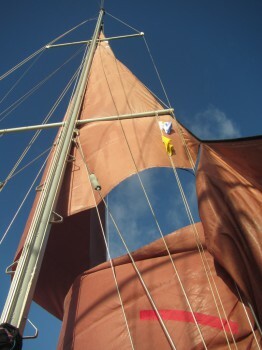 Our only criticism of our Doyle Caribbean mainsail is that it was not equipped with sufficient slides. Less slides means more work for the ones which are there, and we found that we broke them regularly. (At the rate of about one per week, when on passage.) When we complained to Bob he told us to go ahead and have new, intermediary ones fitted, at the expense of Doyle Caribbean. Well, you can’t say fairer than that! We did the deed, and the problem was solved. No more broken slides, and we also find that we don’t need to apply so much halyard tension. 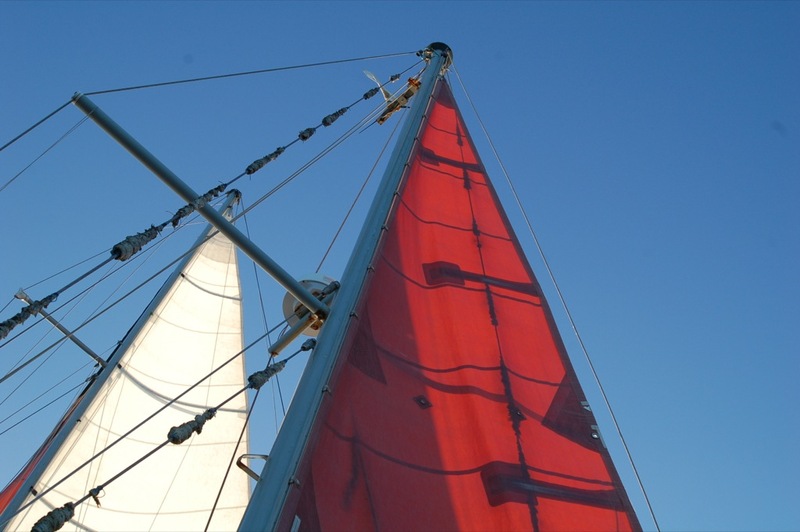 Previously, the luff of the sail was inclined to sag, between the slides, unless we all got together and strained on the halyard. Three and a half years down the road, or across the oceans, the sail is still as good as new. So, when we needed a new mizzen… No prizes for guessing who we turned to! As a matter of fact, we also got quotes from a few other lofts. We were in England at the time, but Doyle Caribbean’s quote was cheaper than any of the English lofts – and that, even taking into account the cost of shipping the sail (to Uruguay) and paying $500 US in import fees! The new mizzen arrived a month ago, and it’s as pretty as its big sister. It’s strongly built, with nice stitching. The corner patches are even bigger than the ones on the main; I guess that’ll be because we explained to Bob that our mizzen stays up to see the heaviest weather – and he listened. The square-cut roach, at the top, was a surprise… but if it works, we’re not complaining. And it does work. 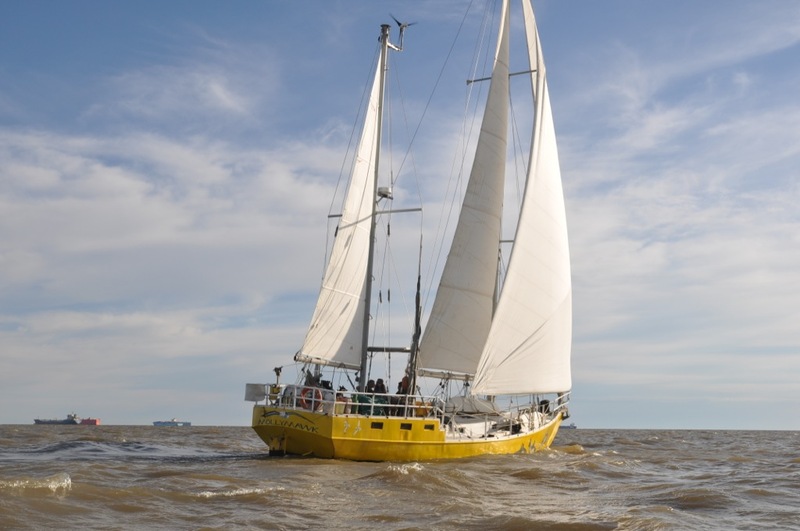 So far the sail has only had one outing – a 100 mile sail from one side of the River Plate to the other – but the weather is pretty variable down here, and even in this short distance we faced a variety of conditions. We also did a quick photo-shoot, which involved lots of tacking and gybing (and which almost involved the loss of the photographer, cast adrift in the dinghy), and the sail performed wonderfully well throughout. 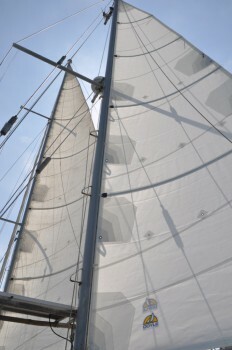 On the wind, the full-length battens give the mizzen a shape which was lacking in either of our previous two. 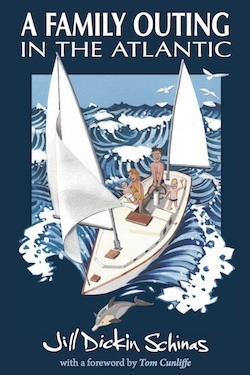 (The first, by North Sails, was the worst-cut sail we’ve ever had in yonks and yonks of sailing and cruising. The second, made in China, had no roach, although we specifically requested it, and was about as useful as the bag it came in). Don’t believe anyone who tells you that a mizzen is just a steering sail. Ours is small and tall but it certainly provides driving force, and we reckon that this new Doyle’s sail will be much more powerful than were either of the others. 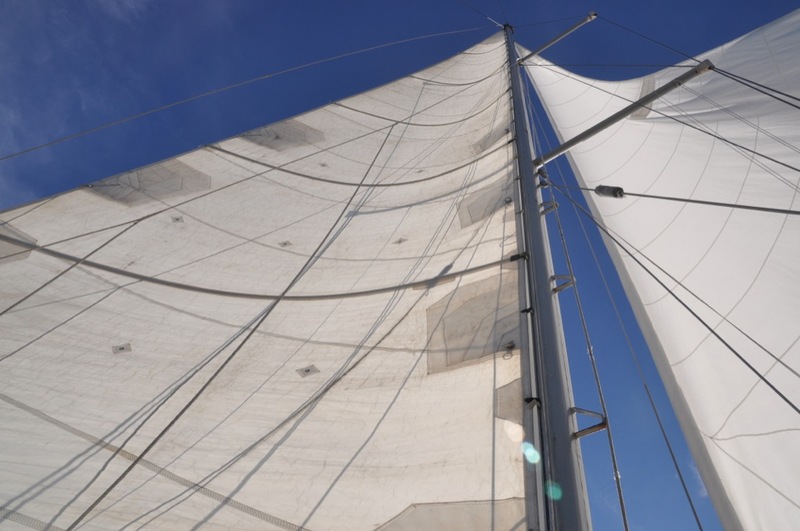 Off the wind, with the boom out as far as it would go, the old sails formed scalloped bags against the stays; but the new one, thanks to its battens, retains its shape. On the debit side, there are fewer slides than we requested…. All we need now is a Doyle Caribbean genoa. Unfortunately it’s rather large and would cost somewhere in the region of $4,000 US. If anybody feels like sponsoring us we’d be happy to emblazon it with just about any logo so long as it’s not for Shell, Gazprom, or any other monster of iniquitous, non-sustainable living. In the meantime, we’ll just carry on mending and re-making that old tan rag.